It’s a remarkable sight, if you’re lucky to catch it. Steamboat certainly lives up to its name, shooting up plumes of billowing steam that dwarf the surrounding lodgepole pines. According to Lee Whittlesey’s Yellowstone Place Names, Steamboat Geyser was named in 1878 for the sound its eruptions made: similar to a spinning paddlewheel. Although it has not always been the tallest of all time—there are several past geysers that have surmounted Steamboat, including Excelsior Geyser in Midway Geyser Basin—Steamboat Geyser has no real competition right now. And yet, while it’s the tallest active geyser in the world, it has an incredibly spotty performance record: for all its hydrothermal power, Steamboat Geyser rarely erupts, and has never had a regular eruption schedule like Old Faithful Geyser. Instead, it hopscotches between long dormancy and furious activity. Early on, Steamboat Geyser attracted scant attention. It was even mildly derided. Read what the 1899 Haynes Guide has to say about Steamboat as well as a few neighboring geysers: “The Fearless, Vixen, and Steamboat are geysers of minor importance, but are well worth a visit, as well as numerous other springs and pools yet unnamed” (35). 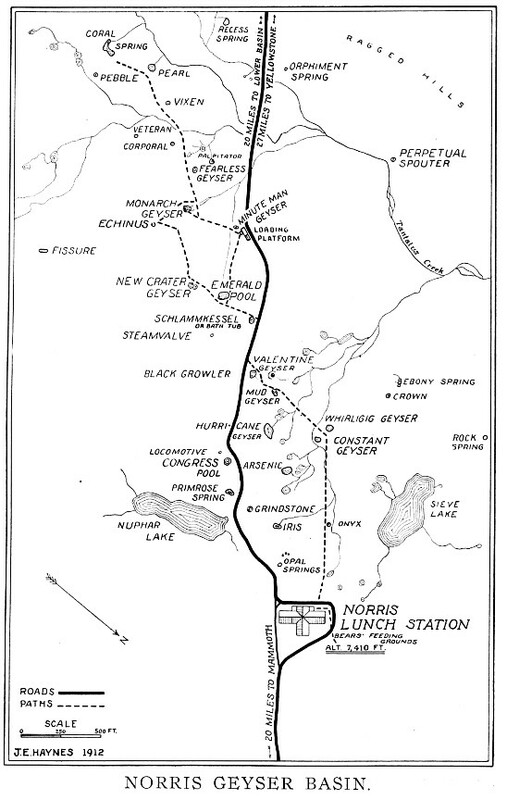 In some cases, Steamboat would not even be included in a map of the area—such is the case with the map below, taken from the 1912 Haynes Guide. In the early days of the Park, Steamboat Geyser was nothing to boast about. Yellowstone National Park keeps a list of Steamboat’s eruptions, going back to its naming in 1878. That year, it erupted at least twice, before going dormant until 1890. That year, it sputtered back to life for one eruption, before going back to sleep. It would go on to erupt in 1891, 1892, 1894, 1902, and 1911: each time only once (on record) before resuming dormancy. Then, Steamboat Geyser slept for 50 years. It slept through the demise of many geysers, including Excelsior Geyser. It slept through extensive changes to Yellowstone National Park’s visitor infrastructure. It slept through the 1959 Hebgen Lake Earthquake. Then, rather spectacularly, it roared back to life. After erupting once in 1961, Steamboat Geyser erupted at least seven times in 1962, and then—between 1963 and 1965—erupted a grand total of 77 times. To give you an idea of how astounding that is, since the Park began keeping records of Steamboat Geyser in 1878, it has erupted 168 times. A simple feat of division tells us approximately 46 percent of Steamboat’s eruptions happened in that three-year period. In March 2018, Steamboat once again roared back to life after being dormant since September 3, 2014. According to researchers at the Yellowstone Volcano Observatory, this uptick in eruptions may be signaling a new period of activity for Steamboat Geyser. Since the start of recordkeeping in 1878, Steamboat has flitted between spectacular activity and utter dormancy. Between 1911 and 1961, it didn’t erupt at all! Then, all of a sudden, between 1962 and 1965, it erupted 77 times! There is no way to predict the length of the current streak – it could be over, or just the beginning of a long period of activity. We’ll have to wait and see.